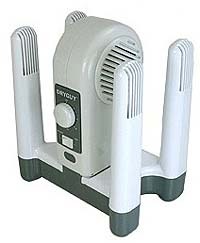 We recently used the DRYGUY Wide Body Boot dryer and could not be more happy with it. This unit has worked exactly as advertised and hasn't given us a single issue. It has handled all of the boots we have dried, including both Globe and Warrington brands. It has also dried utility gloves, structural firefighting gloves, athletic sneakers, and even a knit stocking cap. The DRYGUY Boot dryer features a timer that can be set for up to 3 hours, as well as an option to use heated air if desired. These features allowed us to take two pairs of soaking wet structural firefighting gloves, leave them overnight, and return in the morning to find them completely dry. Not an ounce of moisture left in them. It did the same for our structural boots, as well as soaking wet running shoes which it dried completely in under an hour! The dryer is made of lightweight plastic, and my initial concern was that it would not stand the test of time, and would break before long. However it has proven me wrong. We have used it for the training staff during the academy we are currently teaching, and after a few months it is still working perfectly. DRYGUY claims to have an excellent warranty if anything were to break, but we are yet to put that to the test. I would highly recommend this product to anyone. 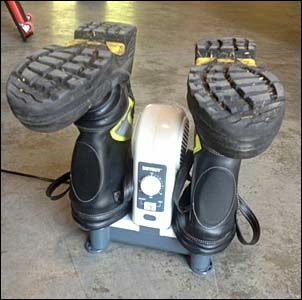 Get your own Dry Guy Boot Dryer, here!